Picture - A E16A1 of the Yokosuka Kokutai (Naval Air Group), as can be seen by its tail markings. 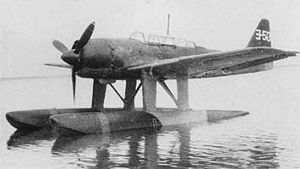 The Aichi E16A Zuiun (瑞雲 "Auspicious Cloud", Allied reporting name "Paul") was a two-seat reconnaissance seaplane operated by the Imperial Japanese Navy during World War II. The Aichi E16A originated from a 1939 specification for an replacement for the Aichi E13A, which at that time had yet to be accepted by the IJNAS. Disagreements about the requirements in the 14-Shi specification led prevented most manufacturers to submit designs, but in 1941 a new 16-Shi specification was drafted by the IJNAS around the Aichi AM-22 design which had already been made by Aichi engineers Kishiro Matsuo and Yasuhiro Ozawa. The first AM-22, which first got the experimental designation Navy Experimental 16-Shi Reconnaissance Seaplane and later the short designation E16A1, was completed by May 1942 and was a conventional, low-wing monoplane equipped with two floats and had the unusual (for a seaplane) feature of being equipped with dive brakes, located in the front legs of the float struts, to allow it to operate in a secondary role as a dive bomber. E16A1 Main production version. E16A2 Single prototype with a 1,560hp Mitsubishi MK8P Kinsei 62 radial engine. Green, William. "Aichi E16A1 Zui-un (Paul)" War Planes of the Second World War, Volume Six: Floatplanes. London: Macdonald & Co.(Publishers) Ltd., 1962, pp. 116-118. Taylor, Michael J.H. Jane's Encyclopedia of Aviation. London: Studio Editions, 1989, p. 43. Aichi E16A Pictures and Aichi E16A for Sale.